Old or young- we all love sweets! 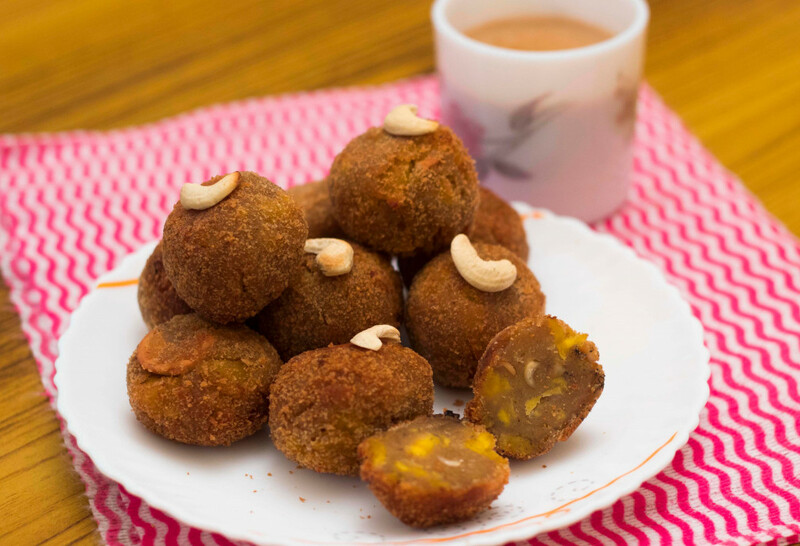 Try this simple, and delicious sweet banana and bread fried balls. They are healthy and not too sweet- so the perfect choice for after school snacks. Peel the bananas, remove the center line of tiny seeds and then chop finely. In a bowl add bread crumbs, chopped bananas, ghee, sugar (to your preference) and a handful of cashewnuts. Combine everything well until they clump well to form balls. Check the sweetness at this point and adjust accordingly. Finally roll into small balls. Then place bread crumbs onto a plate. Coat the rolled balls into the bread crumbs. Once hot, gently drop the balls in it and fry until golden brown. Take out with a slotted spoon and drain onto a tissue paper. Serve hot or cold. Try a much more healthier version by coating the balls with powdered oats. It will tend to be a bit more crispier. Add in raisins or any dry fruits of your choice also. If you do not have bread crumbs, you can powder bread in the grinder and use in the same manner.